Lately I've been thinking about terrines of all kinds. The galantines, the veggie terrines which burst with the season's flavor, the meats and fish that are so welcome at the table starting around this time of year for us now that certain fresh veggies and herbs are coming into their flavorful season. We love to prepare them at home with the best we can get and serve them to larger groups for lunch, the visual results are often really very good for a relatively low time investment. Last year I picked up a bunch of moulds of different shapes and it's time to crack them out again. 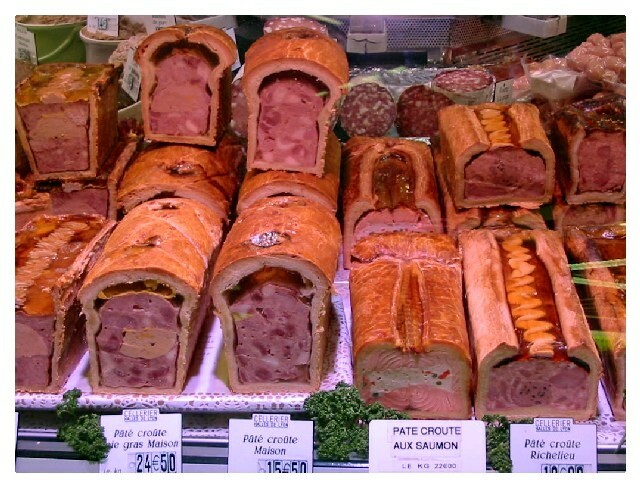 I would love to hear terrine/mousse/galantine experiences, for ideas on what kinds of interesting combinations might be hiding in the stalls at the market. Presentation ideas, classic combinations, things that were in but have gone out of style, recent pleasant suprises... Any ideas? I absolutely love making terrines/galantines. Due to my location (Scotland), I have mostly made game terrines. Aside from the French ones I have made various British relatives too (potted meats, pies etc). One thing that I would like to know is what base do people thing is best for fish terrines? I mostly use cream and egg to set the fish proteins, but find that this can be a bit dry. This galantine is based on a 17th century English recipe. Chicken, herbs, artichokes, nuts, barberries, flavoured with nutmeg and ginger. Another one. These are leftovers, so not the best cut. Basically trout and cod surrounded by a forcemeat baked in brioche dough. Foe reasons I can't explain the oven turned itself off in the first 10 minutes, I was too stupid to notice, so the brioch isn't as light as I would have liked. I am going to the Leeds Food Symposium tomorrow. I am making another historic british thing, sort of a beef terrine. I will try to take photgraphs of this as well. One thing that I would like to know is what base do people thing is best for fish terrines? I mostly use cream and egg to set the fish proteins, but find that this can be a bit dry. I was just reading (and finding great inspiration in) a recipe this morning, from Richard Olney's Simple French Food, in which he composes his forcemeat from a base of duxelles, with the addition of a panade which has been made from stale bread and garlic which has been pounded made into a mush with fish fumet and reduced over heat to a paste, adds eggs, parboiled and squeezed spinach for color, seasonings, and finally the minced whiting and diced salmon. He then lines the terrine with sole fillets which brim over the sides, flesh side out and skin side in, and fills the terrine. This is slowly cooked in a bain marie, chilled, and served with a whipped tomato cream. Ah, this (or something similar) is in the TIME-LIFE 'terrine' book, so I will try this soon. A terrine of mine that I partiularly like consists of adding a healthy cupful of pureed raw sea-urchin coral to a basic whiting forcemeat before sieving it and incorporating a handful of chopped pistachios at the same time as the cream. The terrine is lined with sole filets as in the following recipe and the clean but fragile note of urchin sweetness proscribes any accompaniment other than trembling fish jelly. I bought it new at $25 and am shocked to see it used for $75! I guess it is as precious a book as I take it for - amazingly erudite and well-researched with stunning photographs. It is true eye-candy and one of my favorite books to just languish through with a cup of tea. It covers forcemeats, pâtés and terrines, aspic jellies and sauces, galantines, and non-traditional versions including bouchees, vol-au-vents, porozhki, kulebyaka, and English pies. Adam, the one you might appreciate that I've always wanted to try is a complicated recipe of a stuffed boar's head where, basically, the head of a boar is shaved, stitched up, and most of the internal bone structure removed. The snout is stuffed with a forcemeat of boar, the entire head is covered with a dark brown chaudfroid or brown aspic, and the snout itself is sliced. Now I'm inspired to make something this weekend! Aw, Lucy..... You're killing me!!!! Making a brioche- or dough-encased terrine is the one thing I've never done. I'm not much of a bread maker and always resigned myself to caul-surrounded terrines. We had a lovely foie gras-based restaurant (you might have read about it...) that closed recently. They did a smallish version that I adored but don't have a clue where in California to buy any like the kind you've pictured. Those are beautiful Adam and Lucy. 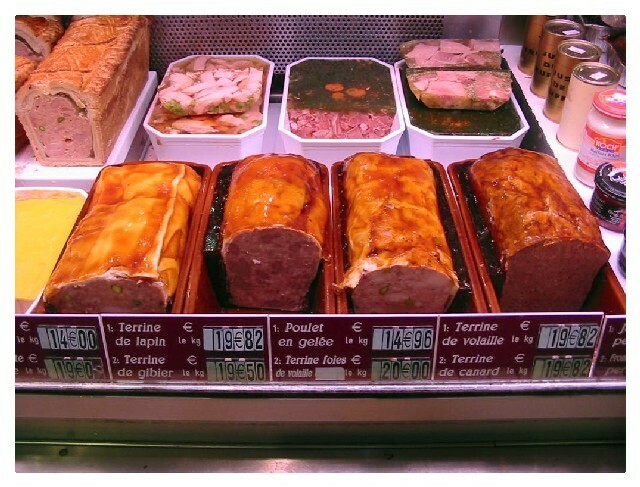 I love terrines and have acquired many molds on my trips to France, but have always been hesitant on making one. It seems all the recipes I look at are too complicated in their choice of ingredients. Any ideas for a terrine with products I may get readily in the states? It looks like, in order to get the round shape in the cross cut of the terrine on the left front, they filled it halfway with forcemeat, and then added the central oblong cylinder, and then filled it up the rest of the way. Yes? Adam, what did you use as a mould? What did you line the mould with? It really looks very good. Care to share the recipe? It is easy to make terrines/pates in the U.S.! All you really need is pork. I've made twice (including just last night!) a duck terrine from a recipe by James Peterson that requires only ingredients easily found here in New York. Pork shoulder, fatback, duck, chicken liver, pistachios, bread crumbs... no problem! They can be as simple or as complex as you like. 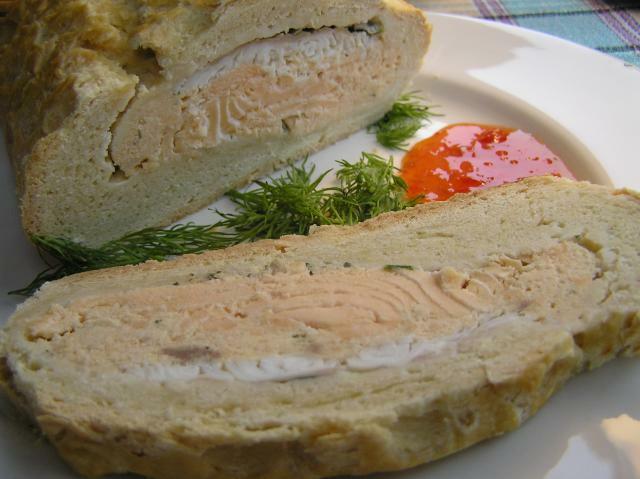 The galantine above is basically a de-boned chicken filled with a forcemeat of pureed chicken, cream and eggs. After that it is rolled in cheesecloth etc and poached. This is really easy. The fun is choosing the extra bits for colour, texture and flavour. An the really good bit is that you can make them well in advance. Or if you live in Paris you don't even have to make them at all! No mould, this is all chicken. The contrast on this photo is a little off I think. Basically, lay out the boned chicken on cheese cloth, fill roll and poach. Place under a weight when cooked. It is a corn fed chicken, so the yellow edge is actually the skin. edit: Eh, I just made it and didn't bother with writing down the recipe, but is a pretty basic chicken mousse (chicken, cream, eggs) flavoured with this and that. This is kind of a bad example as it is used odd ingredients, but I would be happy to make something similar and take some photographs if you like? Dear Adam. 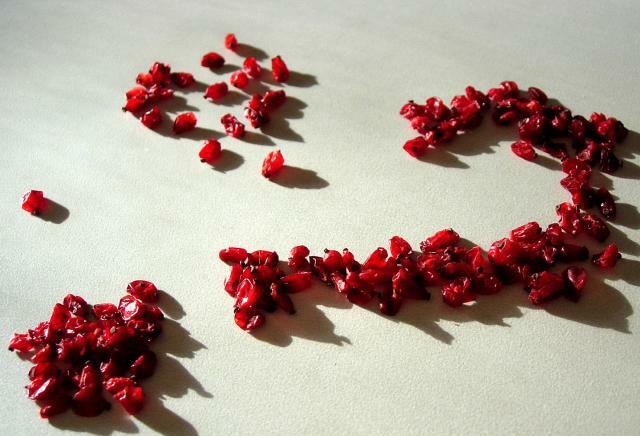 What are barberries? These. They were a popular souring agent in the UK. I stole the image from this recent discussion. Barberries. And the herbs? Thyme, chevril, sage? ...as it is used odd ingredients, but I would be happy to make something similar and take some photographs if you like? Oh yes please Adam, and can you please take pictures especially of the wrapping and of your method of placing it under a weight. Thank you. [squeezes forehead]. Parsley, tarragon and thyme. And some preserved ginger. OK. I will make a galantine of some description and take some photgraphs etc. If I get a chance, maybe this Monday. Thankfully I have just bought a fish-kettle. I've made twice (including just last night!) a duck terrine from a recipe by James Peterson that requires only ingredients easily found here in New York. Pork shoulder, fatback, duck, chicken liver, pistachios, bread crumbs... no problem! Seth - It's beautiful! Isn't it strange that we all start making the same things at the same time. Pistachios are for the colour (like carrot, pickled tongue, squares of lard and truffles) and texture contrasts I would thing. They sometimes take up flavour elements as well. Yes, that is right. If you look at it carefully, you can see a faint line where the second layer of forcemeat was put in. I really like the look of the red mullets on the right. I wonder if you could make a fish 'boulibaisse' terrine (saffron, fennel, orange zest etc), without it looking like a '70's dinner party? Whenever I get venison or an excess of duck, it when I make my terrines. The biggest struggle I end up with the fact that since I generally under salt my cooking, my terrines end up being a bit bland. It is surprising how some ground up meat which is sauteed and tasted, can taste more flavorful because it is warm. The real trick is patience -- cook up a bit of your terrine and let it COMPLETELY cool to see if it is seasoned well enough. I can't tell you how often I've ended sprinkling fleur del sel over slices of a finished terrine just to give it enough 'umph. This thread reminds me of a pot luck I attended once, to which I brought a lovingly constructed country terrine not unlike the Peterson one above. After a brief walk, I returned to the kitchen to find out from the host that, because she couldn't find me, she had "put the meatloaf into the over at 400F to warm it up." I'm glad I didn't bring my knives.